The Second Annual Morse Elementary Book Bazaar will be taking place at the Morse Elementary School, at 475 Cherry St., Troy, MI 48083. That is a Saturday, from 12:00 pm (noon) until 4:00 pm. E.M. Olson will be there with copies of Oliver the Toaster and My Math Monster. There will be readings by some authors and a chance to meet other local authors and book enthusiasts. The Event is sold out. Hope to see you there. The Summer Indie Book Fest is taking place at the Hilton Garden Inn, in Troy Michigan from 10:00am until 6:00pm. E.M Olson will be there with copies of Oliver the Toaster and My Math Monster. You will also get to meet many other local authors. Admission and parking is free. Supporting independent authors is priceless. Oliver the Toaster and My Math Monster are now available as audio books (available through your favorite audio book retailers). 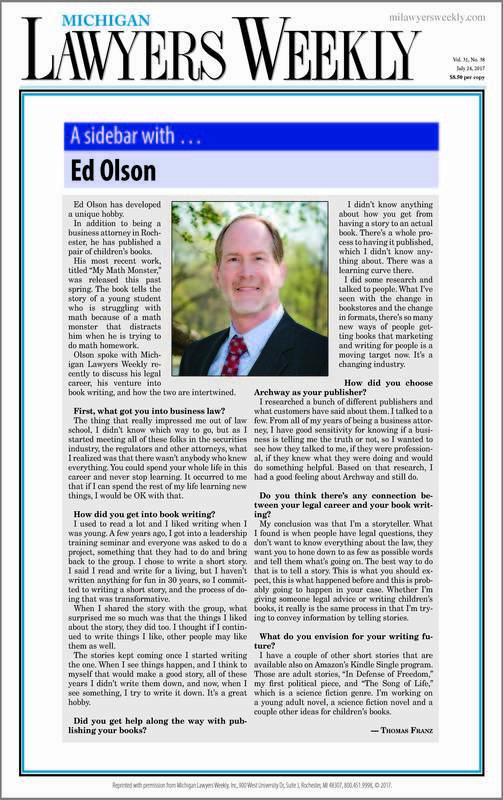 E.M. Olson will be at the Books & Authors Event at Leon & Lulu's shop in Clawson Michigan. E.M. Olson will also be reading from Oliver the Toaster from 11:30am until 11:45am (the first children's book reading of the Event). Looking forward to meeting a bunch of other authors from the local area and beyond. Located at 96 West 14 Mile Road, in Clawson, the Event will run from 11 am to 5 pm. For more information, check out the Books & Authors' Event information for Leon & Lulu's. I had a very enjoyable time meeting with the owner of Cottage Used Books, store in Goodrich Michigan (that is 7285 S. State Road, Goodrich) on Saturday, June 3, 2017 from noon until two pm. The weather cooperated and it was a beautiful day outside in the "author tent". Thank you to all who participated. I am looking forward to setting up more events soon. A great book signing event was held at the Paperback Outlet (29170 Hoover Road, Warren, Michigan - between 12 and 13 Mile Roads) on Saturday, May 13, 2017 from noon until two pm. We met the awesome staff and a bunch of customers. What a great day to talk about and sign some books. Thank you to the owners of the Paperback Outlet and to the new friends we made at the event. EM Olson was interviewed by Alisa Zee for the CBS Radio stations, in the Detroit Area, it was radio station WOMC 104.3 FM on Mother's Day, May 14, 2017 between 6:00am and 7:00am. In case you missed it, I am still trying to get a link or a copy of the interview. Was at Barnes & Noble in Rochester Hills on March 25, 2017. Thank you to everyone who participated. There were twelve local authors and lots of readers. Copies of Oliver the Toaster and My Math Monster were on hand for signing. Several copies of both books were signed and left at the store. So, you can still get your signed copy, only as long as supplies last. Oliver the Toaster can by found on page 33 of the 2016 Ingram's Children's Holiday Gift Books guide and directory. My Math Monster is also featured on the iAuthor website.